How can we reduce hunger and poverty, improve rural livelihoods, and facilitate equitable, environmentally, socially and economically sustainable development through the generation, access to, and use of agricultural knowledge, science and technology? 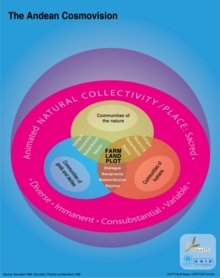 Agriculture at a Crossroads: Food for Survival is the title of a 62 page summary of the main findings of the IAASTD, complemented with conclusions and demands drawn from the report by Greenpeace International. A strategic forecast paper of "Deutsche Bank Research", Germany's leading Bank's think tank, comprising main findings of recent agricultural assessments and market reserach, has come to conclusions similar to the IAASTDs main findings. 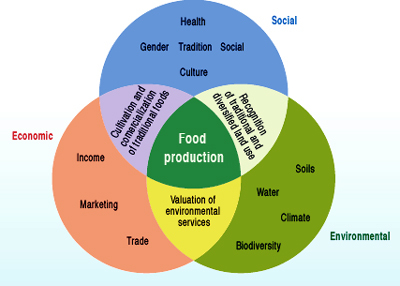 The paper, entitled The global food equation: Food security in an environment of increasing scarcity recommends heavy investment in smallholder farmers and rural infrastructure as well as public R&D in this field, an ecological adaptation of agriculture and major institutional change. 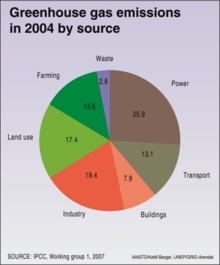 In an open letter to the FAO CSO representatives from around the world expressed concern that the World Food Organisation's high level expert meeting "how to feed the world 2050" on October 12-13 2009 did not draw from the major groundwork conducted by the IAASTD and was about to ignore the Assessment's key findings. In a response, Hafez Ghanem, FAO Assistant Director-General assured the CSOs that the IAASTD was indeed taken into account, would be presented at the meeting and was now linked to it's key background documents. 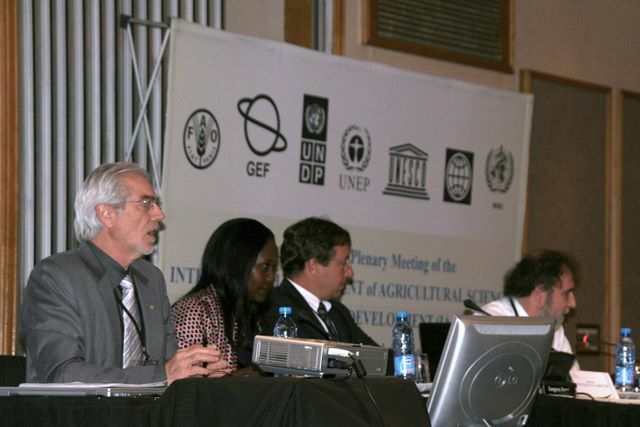 The "Global Forum on Agricultural Research" GFAR is conducting an electronic and regional face-to-face consultation process which is to culmanate in a Global Conferences on Agricultural Research for Development in March 2010 in Montpellier in France and invites all interested stakeholders to participate. 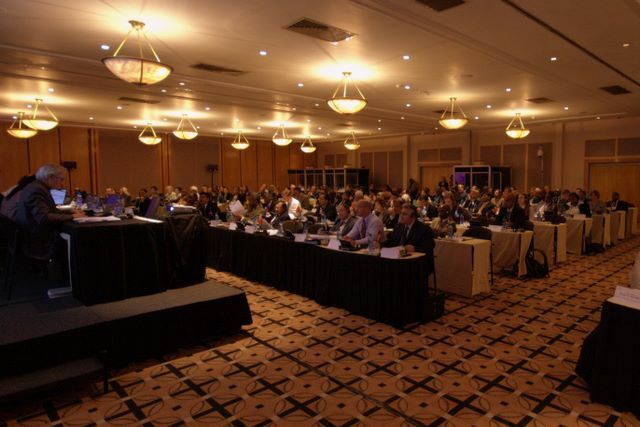 Representatives of 61 governments, the Worldbank and all UN Agencies, as well as about 50 NGOs were meeting 6 to 12 April 2008 in Johannesburg for the final intergovernmental plenary of the IAASTD to find consensus on the international and 5 subregional assessments. On Friday 11th 58 governments concluded their line by line approval of the Summaries for Decisionmakers and of a Synthesis Report and accepted the underlying 2000 pages of scientific evidence in the assessment reports. A United Nations process to identify the best available and newly needed science, technology and knowledge to answer the question above. Initiated by the World Bank in Johannesburg in 2002 this process started with regional consultations in eleven regions of the world and was endorsed by a Steering Committee of 40 representatives of governments and civil society in 2003. 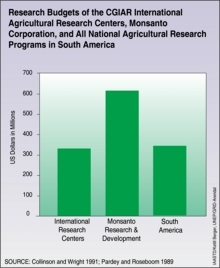 It was co-sponsored by the World Bank, UNEP, FAO, UNESCO, UNDP, WHO. Upon the request of an intergovernmental plenary in September 2004 in Nairobi more than 400 carefully selected scientists and experts produced a global and five sub-regional assessments as well as a Synthesis Report which have been reviewed in two consecutive rounds by hundreds of colleagues as well as institutions and the public at large. The process was overseen by a multi-stakeholder Bureau from governments and civil society.The Assessment was finally adopted by 58 participating governments in April 2008 in Johannesburg. The process is a UN multi governmental process, which means the participating member states representatives make the final decisions and adopt the final report. A multi-stakeholder Bureau of 60 persons representing governments (30), civil society (22) and international institutions (8) has been set up to oversee the process. The Bureau elects 2 chairpersons and a Secretariat, controls the budget and agrees upon the selection of experts and authors, facilitates the public outreach and capacity building. The Chairpersons with the support of the Secretariat will facilitate and organise the process. 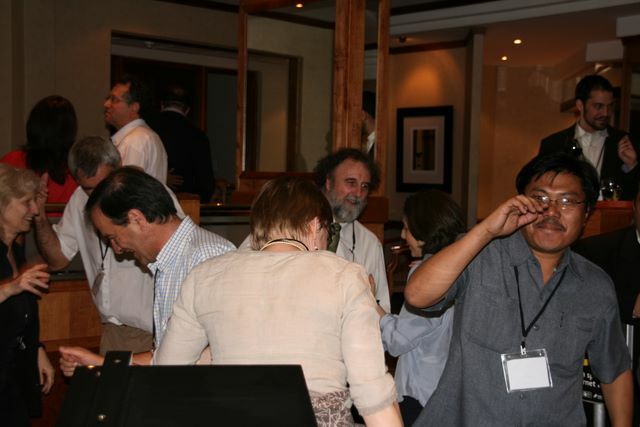 Drafts of the International and subregional Assessments as well as the first draft of the summary for decision makers (the document formally adopted by the participating governments) were available for review until May 31 2007. They were substantially improved as compared to their first versions. The first draft was open for review and comments until September 2006 and is now being re-written by the authors. 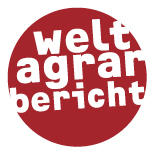 A second draft will be online in March 2007. At its last meeting in Montpellier the Bureau of the IAASTD adopted the outlines of the global and sub-regional assessments. The revised global and remaining sub-regional outlines, the minutes of the Bureau meeting, revised rules and procedures, timeline and budget are published at the official web-site at www.agassessment.org. 8-11 February Central and West Asia and North Africa, Rabat, Morocco. 92 specialists participated in the meeting in Bangkok. A draft annotated chapter outline was developed -- this draft will be available later this month for comments after review by the Bangkok team. 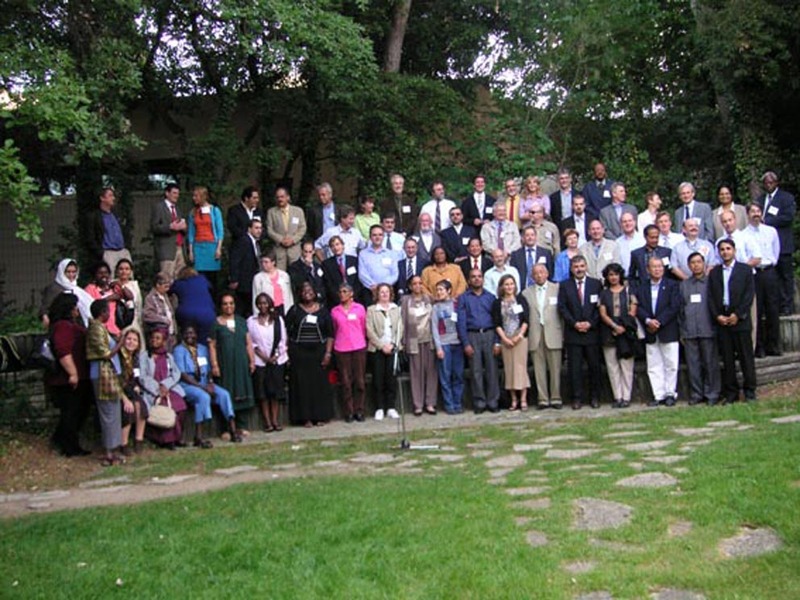 The first meeting of the parties (governments), the 5 co-sponsoring UN agencies and the World Bank as well as civil society representatives took place at the UNEP headquarter in Nairobi from August 30 to September 3rd 2004. The government representatives (45 countries present) decided to go ahead with the Assessment. They agreed on the content and scope of the Assessment and adopted outlines and procedures, a time-table and a baseline-budget of US$ 10,7 Mio. A Bureau consisting of 30 government representatives, 22 representatives of civil society and 8 representatives of international institutions was established to oversee the process. The two co-chairs identified by the Bureau will be Hans Herren and Professor Judi Wakhungu, the Director of the Secretariat is Robert Watson. A Steering Committee of 40 representatives from governments, agencies, industry, farmers and other rural producers, consumers, environmental and other NGO's produced a basic document calling for the International Assessment. Jan Van Aken , Greenpeace Intl.